produced by Special Recordings Inc. This record is in the worst condition. Recommending that you not play it with headphones. Enjoy the sound of old vinyl rescued from the department store demolition! Track 11 - shopping holiday! 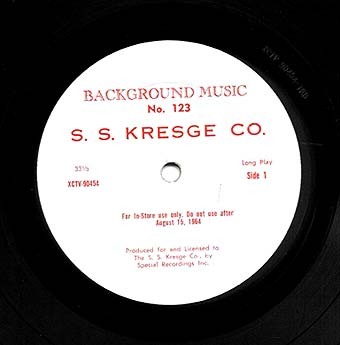 This recording of lovely in-store background music was created by Special Recordings Inc. for the S. S. Kresge Company, predecessor of today's K-Mart department stores. The music was intended to be piped through the store for a pleasant shopping experience. You should have seen me when I came across this record. I flipped! 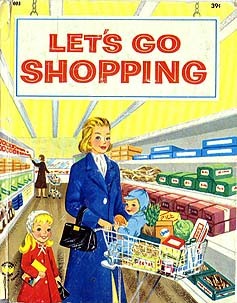 I love this old hop-skip-and-jump jolly string stuff, because it reminds me of shopping hand in hand with my mother. Don't you miss the old department stores? Did you have Murphy's Mart, Zayre, Woolworths, Roses, Nachman's, McCrorys, old Monkey Wards', Philadelphia Sales? "Sebastian Spering Kresge worked as a traveling tinware salesman (1890-97) before opening the first of his discount retail stores whose merchandise was all priced at less than a dime. He went into business in 1897 with one of his customers, J. G. McCrory, who owned a chain of stores in the northeast. Together they expanded and opened new stores before Kresge bought out McCrory and incorporated as S. S. Kresge in 1912 with 85 stores. By the mid-1920s, the S.S. Kresge Company was opening locations that sold items for $1 or less, a precursor to the current discount store. These 'green-front' stores often were right next to the traditional red-front five-and-dime Kresge stores. the first Kmart discount department store opened in 1962 in Garden City, Michigan. Seventeen additional Kmart stores opened that year. "Kresge [was] a thrifty and caring individual with an increasing sense of responsibility to return to society a major portion of his already sizeable wealth. To commemorate the 25th anniversary of his company, he established The Kresge Foundation in 1924 through an initial gift of $1.3 million. By the time of his death, at the age of 99 in 1966, Sebastian Kresge had made additional personal gifts totaling over $60 million."